[tps_header] Summer is almost here, and we can’t wait. We are definitely on the countdown! One of the best things about our little apartment is that it has a great yard, and so being here through the summer while our house is being built means that we’ll still have plenty of room for the kids to run and play. 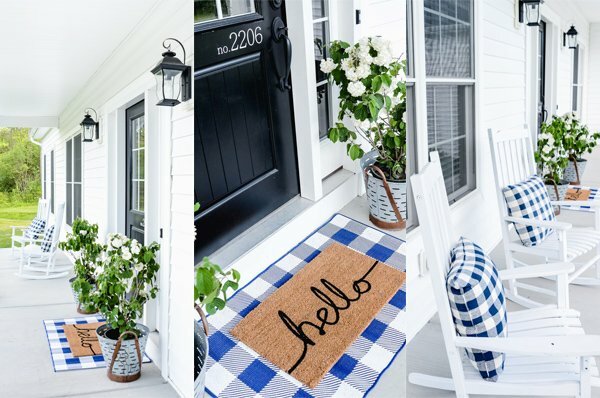 However…there isn’t anything out there right now, so I’ve been on the hunt recently for some really great backyard ideas that I could make for not only our yard now, but also for when we move into our house. 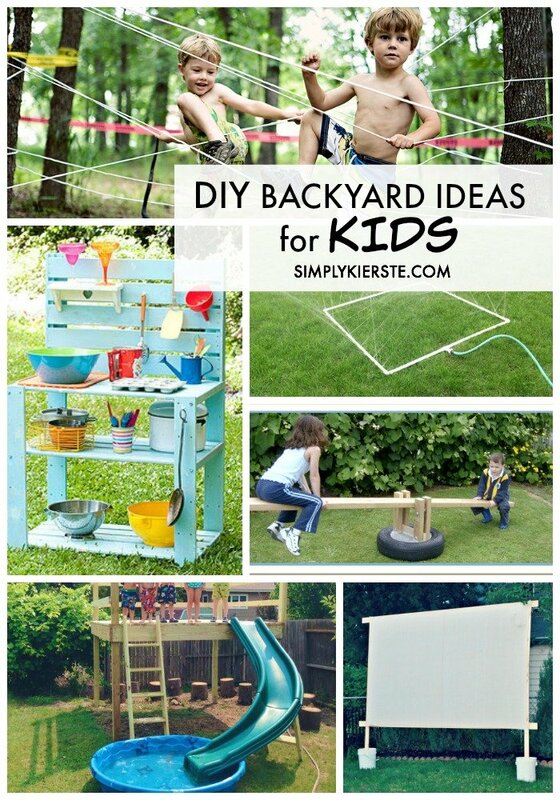 As I searched, I gathered some of my favorite backyard ideas for kids, and I wanted to share what I found with you! I love that my kids love to be outside, and I want to do everything I can to encourage that. 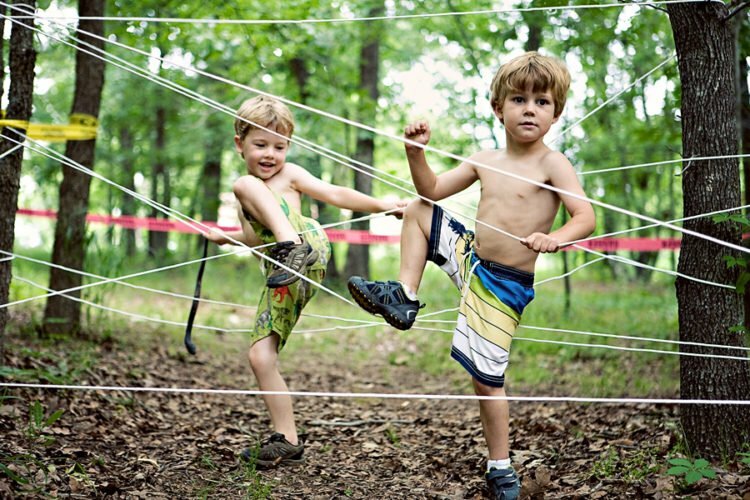 Exploring, creating, playing, running, jumping, climbing—that’s what summer is meant to be! I want less time on electronics and more time outside, so providing really fun activities outside is high on my priority list. 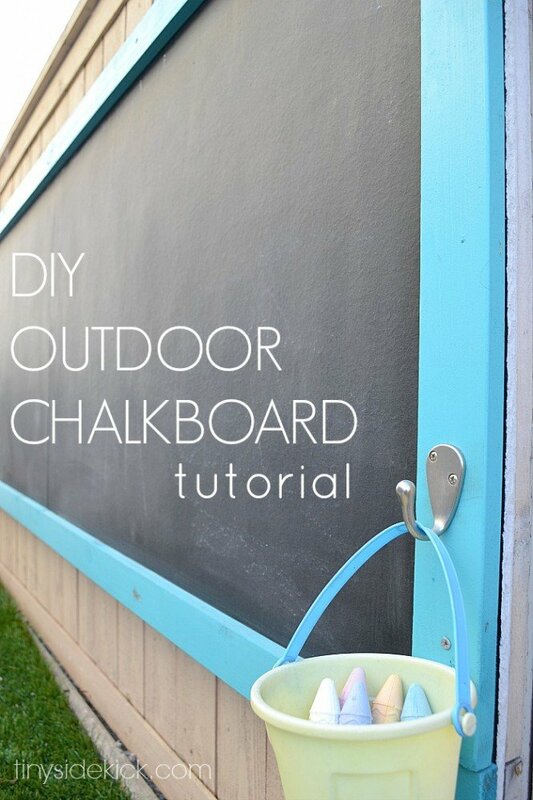 My favorite part about an outside chalkboard is that the mess is outside too. :) My kids love to draw and doodle, and this means hours of fun! 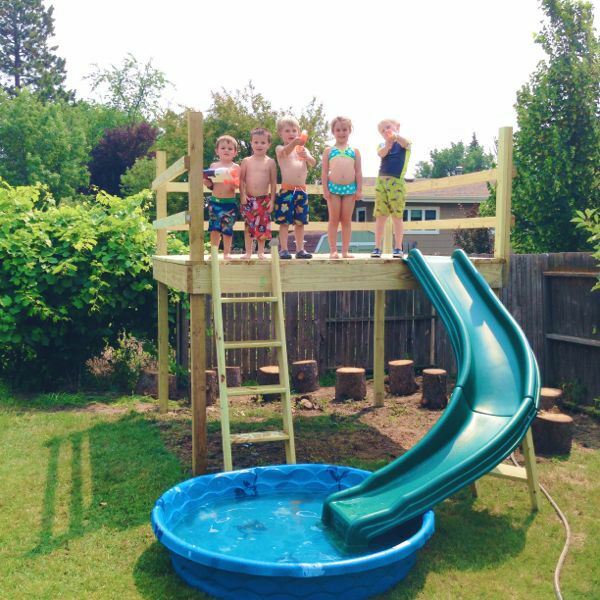 We made this for our kids last summer, and it was a HUGE hit! Everyone enjoyed it, from the youngest all the way up to the adults. 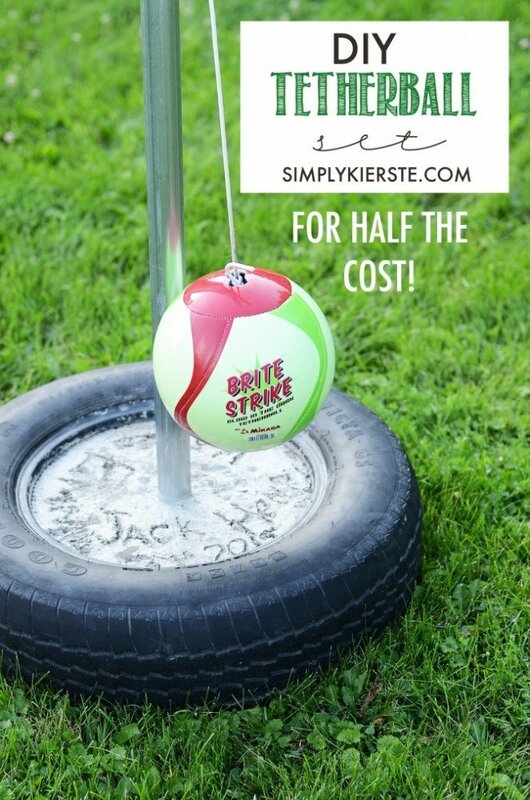 It’s super easy to make, and way cheaper than buying one! 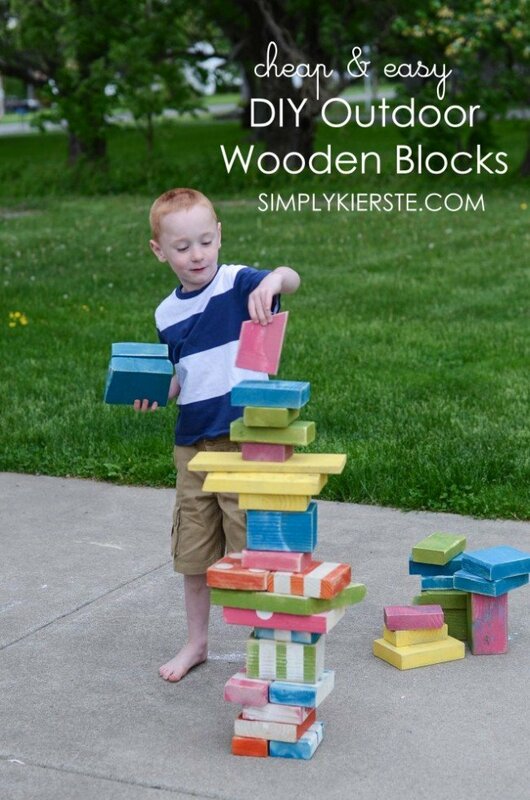 We had a pile of scrap wood sitting around that my kids were always wanting to play with, so I decided to add a little paint and make them into an Outdoor Wooden Blocks set. They are consistently played with, and they literally cost just a few dollars to make! I am in LOVE with mud kitchens, and I cannot wait to make my own version! This project has been on my list FOREVER. This year is the year!! I love the idea of a play platform. We are planning to build a treehouse in our new backyard that has many of these components, but if you don’t have a tree (or don’t want to use one), this is an awesome project! I just love this idea! I know this will be a huge hit at our house! 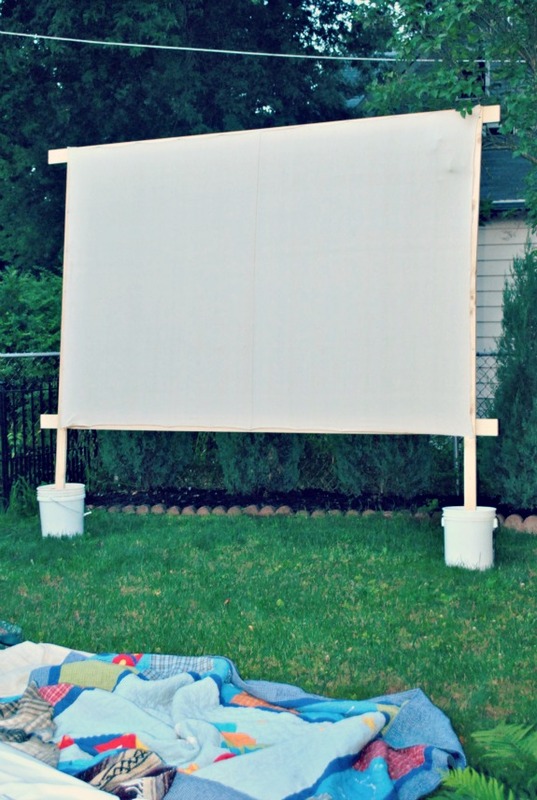 This is always a popular item when we go to the park, so bringing it to our backyard is definitely on the list. I’m looking forward to making our own version, but this looks like a great one! 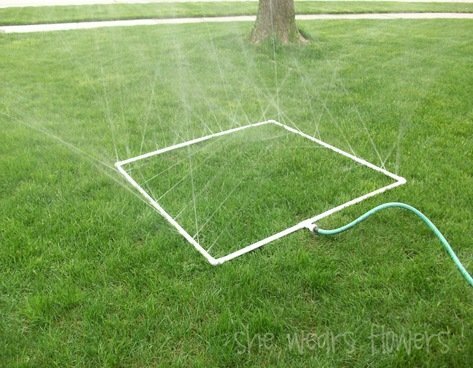 Having this awesome sprinkler in our backyard will make every hot day a cool day! 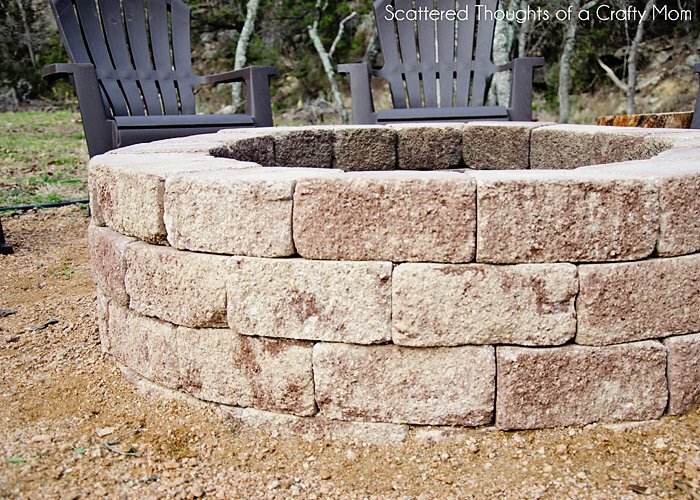 We think of having a fire pit as not optional. It has been the very first thing we’ve done in every house we’ve lived in, and it will be same at our new house too. AND…we are so lucky because the apartment we’re renting has one in the backyard! Wahoo! Summers nights…sitting in front of the fire, roasting marshmallows, laughing with friends and family…perfection. 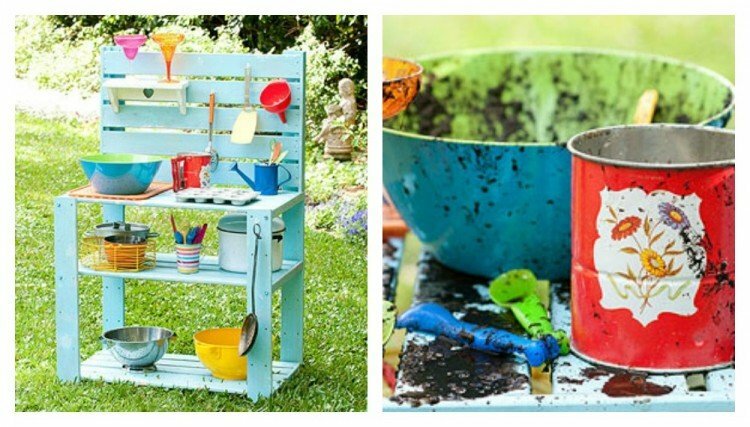 All of these awesome DIY backyard ideas add up to summer FUN for kids and families! What wonderful ideas!! I love your posts! You are performing a great service to all children and families with all of your suggestions and tips . Good for you! Thank you! 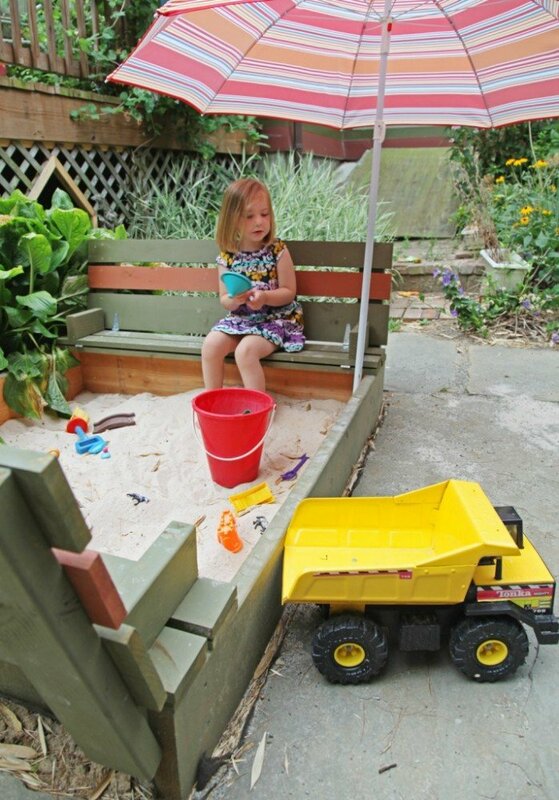 These are such great ideas for a fun yard. Unfortunately we live in an apartment and only have a tiny balcony space. I am looking for ways to make it a fun and safe space for my toddler! This has totally inspired me! Thanks for posting! I love these ideas! The see saw looks really cool, although not as cool (literally) as the brilliant yard sprinkler. Thanks for the great inspirations. This is a great show of your ideas for kids to have such an adventure with– and so easy to get the materials.. thank you– what a super mom you and ((dad)) are— luv the sprinkler- water slide and mud kitchen— all children luv that— and with the sprinkler– it canbe turned upside down– and they can ride their bikes thru –like a car wash…. so many ideas and all of yours are extremely inspiring– thankyou again..